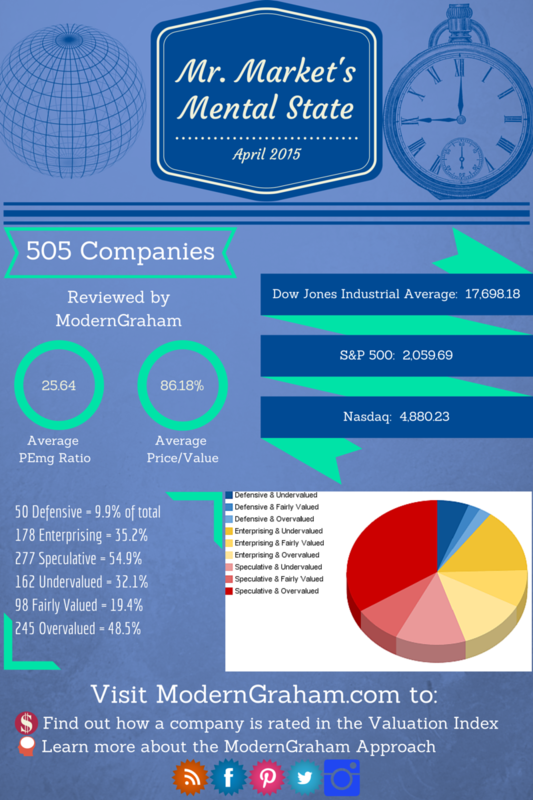 This month, out of the 505 companies reviewed by ModernGraham, the average PEmg ratio (price over normalized earnings) is 25.64 and the average company is trading at 86.18% of its intrinsic value. Last month, the average PEmg ratio was also 25.79 and the average company was trading at 88.03% of its intrinsic value. First of, I’d like to say that this is a great tool and it can certainly be extremely helpful to track sectors & industries & individuals tickers month over month. For any investor (value oriented especially) these types of tools are a necessity and ideally each investor should have a tool or dashboard of their own based on the investing strategy they employ. That said, I’d like to raise a concern about the market valuations displayed here on the basis of the Graham model for calculating (one should really say estimating) the intrinsic value of a company. While ideally the 15% growth rate cap used in the model might hold true/be applicable for say the beginning/middle stages of a bull market, the same cannot be said for a late stage bull market (which we may or may not be entering now). Interest rates will be rising – historically that means a contraction of P/E ratios (so share prices will go down). Global growth is slowing down – a lot of rebalancing and devaluation of major currencies is happening world-wide. Investors should be wary of these factors, and, (presuming the above market state is based off of the valuation model displayed on this site) should question the “intrinsic value” of given tickers/companies. I would argue the model is being too “bullish” and should have the 15% growth rate cap adjusted in expectation of a late stage bull market.